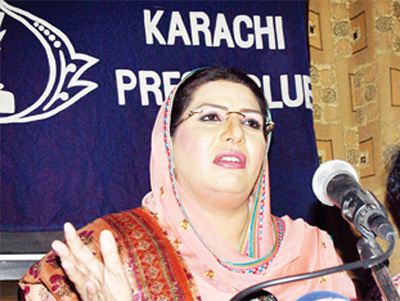 Federal Information and Broadcasting Minister Dr Firdous Ashiq Awan has advised Pakistan Muslim League-Nawaz chief Mian Nawaz Sharif to assist in the relief and rehabilitation of the flood survivors. “Sharif’s must focus on the well-being of the flood survivors and stop criticising the government as this would only add to their miseries,” Awan said in response to journalists’ questions at the Karachi Press Club (KPC) on Tuesday. She said the challenges presently faced by the country in the form of natural and climatic calamities demand selflessness and not opportunism. She also said nature has played havoc in 23 districts of Sindh and five districts of Balochistan. The situation requires the nation to come together and work for the relief and rehabilitation of the survivors, she added. “Since the government strongly believes in self-reliance and self-help, our efforts were to brave the challenge on our own initially,” she said in response to a question regarding support of the international community. The minister said the intensity of the disaster and the degree of loss compelled the government to seek international assistance through the platform of the United Nations. This has not and will not absolve the government as well as the people of the country of their responsibilities to assist the affected people, she added. She also said a media coordination cell has been established in the Sindh Information Department to maintain transparency in the ongoing relief work to be followed by the rehabilitation of the affectees. She told the media that they could be of great help in contributing towards the rescue, relief and rehabilitation of the flood survivors. “It is with this view that we expect the KPC to develop coordination with the press clubs of the 23 affected districts of the province for assessing the ongoing rescue and relief operation jointly undertaken by the National Disaster Management Authority, the armed forces, different government departments, non-governmental organisations and the civil society among others,” she added. She said the media could identify success stories that could be replicated and also point out any lacunae that should be immediately addressed. She also said Zardari is personally reviewing the assistance and support provided to the people in need and has assumed the responsibility to “monitor the monitors”. She further said coordination is the cornerstone of the government’s relief strategy under which all ministers and no less than 15 most important officers of the provincial government are required to report to Zardari on daily basis. Similarly, she added, information officers, members of the district press clubs and representatives of the district coordination officers would daily monitor the relief efforts. Responding to a question, she said the government would utilise local reserves and stock of seeds under its efforts to rehabilitate the affected people. This would be distributed among the farmers and tillers once the water is drained and the affectees could then prepare for the next crops, she added. In this context, she particularly referred to Badin and its adjacent areas where sea intrusion and overflow of canals caused immense damage. “Short-term as well as long-term strategies are being adopted to drain the water,” she added. She said there is no fault in the design of the Left Bank Outfall Drain (LBOD); it was the population explosion that caused encroachments and hindered proper drainage through the LBOD. She also said the government is focused on prevention of health hazards associated with natural calamities and climatic changes. All preparations have been made to ensure vaccination of all children of the flood-hit areas against the polio virus, the minister added.